It took me two years to realise I had been sold twelve plants of false cardamom (Alpinia nutans) instead of true cardamom (Elettaria cardamomum), the source of the kitchen spice. My disappointment was confirmed when they flowerd the following year. 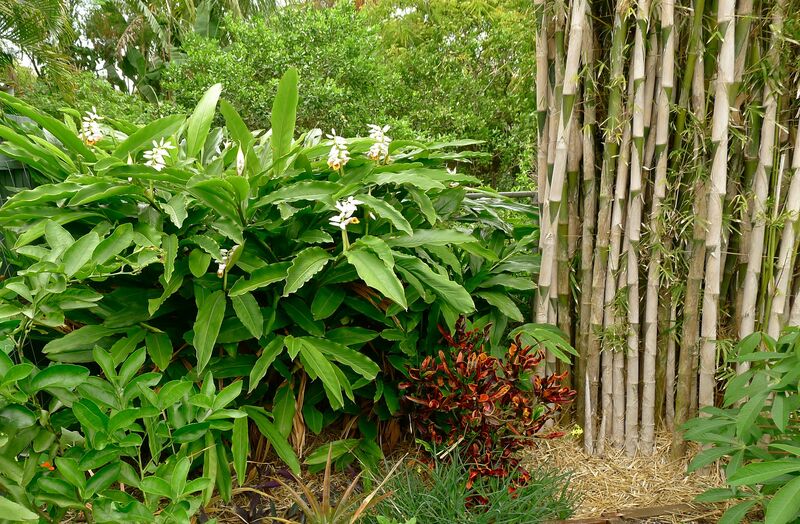 Many of you will be familiar with False cardamom (Alpinia nutans). Landscapers love it since it survives cold and desiccating winds and erratic rainfall. It grows well in frost-free gardens along from Moruya (south coast of NSW) to Cairns. So when I was positive mine were false, I divided the clump up and planted it against the fence. By placing a few crotons in front I recreated the boundary planting I had seen at the village meeting place whilst visiting the Smol Numbas on Malekula Island (Vanuatu). Old stems can be chopped up for compost making or used as a surface mulch around trees and shrub borders. The flowers are edible and are sometimes added to decorate salads and stir fries, or preserved in sugar to decorate cakes. If you’re renting, keep your investment in this spice mobile – grow it in a container. A shallow bowl is preferable to a standard pot because gingers are surface rooting. Their roots may rot in the base of a deep pot during cold, wintry conditions. Use fresh potting or seed raising mix for sowing and growing seedlings. While young, they’re susceptible to various fungal diseases. Don’t expect fungicides to save them. Mulch plants with compost, topping up pots as the potting mix decomposes and the level drops. You can use the leaves of false cardamom for flavouring food and its flowers are edible. But, in my opinion, the ground seed and pods taste disgusting and are no substitute for true cardamom spice. False cardamom is tough, drought tolerant and chopped stems make good mulch and compost. If you want the real deal, buy whole, organic cardamom pods from a health food store. Cut the pods in half (use a sharp knife). Sow the seeds in fresh potting mix, just burying them. Place in a warm, sheltered spot, like a windowsill. Keep the mix evenly damp. Pot up seedlings individually into tubes or small pots. Feed with seaweed, keeping plants sheltered and exposed to morning sunshine. True cardamom is a tropical plant, best grown in a frost-free, coastal climate. False cardamom grows better inland, and once stablished clumps will cope with occasional frosts to -3C. Whichever you grow, for best results provide compost rich soil, an a sheltered spot with dappled shade all day, or full morning sunshine. Mulch these woodland perennials with sugarcane, dried lawn clippings, mushroom compost, or your own garden compost. My one year old seedlings are starting to sucker, so I’ve potted them up from tubes into 100mm pots. The young, aromatic leaves of both kinds of cardamom may be wrapped around fish or chicken and baked or steamed to add flavour. I enjoy baking fish with cardamom leaf with added lime juice or finger lime pulp, whole chillies or pepper. I have no idea it might take to coax my true cardamom to flowering stage, but I’d like to make spice. Then it’ll be perfect for flavouring ginger cake, smoothies and curries. ← My Garden Was Flooded. What To Do? I knew nothing about Cardamom – thank for the pictures, warnings about the false one and suggestion for getting seed for the real deal. I have a false cardamom and it’s growing frolifically. I love the citrusy smell of the leaves and it looks great. But I want to be able to use the spice, so I’ll do what Jerry has suggested. Thanks for the info Jerry, I just planted a whole row at the base of my bund near the neighbours fence as a border, great to know all the diff uses. Thanks Jerry – you’ve inspired me to try growing Cardamom. Will investigate the local health food store. This year we’ve been able to grow ginger and tumeric so Cardamom should grow OK. Finally worked out why I’ve had so little success growing fruit trees, gingers and vegies the last few years – caught Grandma in the act of trying to be helpful by “weeding” around the garden using Roundup spray! Had a little chat with Grandma 😉 Everything seems to be growing really well this year – though some trees didn’t fully recover and have been replaced. Hey guys, all the info contributed here has been really helpful. I also purchased a false Cardamon this am & was under the impression it was the real deal, however all good I will use this for some fill in planting & enjoy the applications mentioned. I also will try to propagate the real Cardamon as my journey of gardening has just begun, so a good project for me. I have just purchased some Cardamom rhizomes from these guys. I too have false cardamom, a huge clump of the stuff but really would like the real thing growing. Only problem I see is will have to be in a large pot so I can keep it mobile and ensure the temperature at it’s location is kept above 22 degrees C.
There is some good info here http://www.kew.org/plant-cultures/plants/cardamom_grow_it.html and note they mention that planting seeds generally won’t work as pods are picked unripe in the first place. I personally have never been able to grow cardamom from seed and have tried for years which is why I searched for rhizomes. Don’t be put off by retailers who want to sell you their stock. They have a vested interest in selling plants. Seed works, their claim is just a claim. Seed is cheaper. There is no need to buy from a retailer, especially as most haven’t the faintest clue what the difference is between true and false cardamom. Learn to be independent, try it yourself. That’s the point I’m making in my blog! Thanks for this. I now know my beautiful cardamom bush is actually false cardamom 😦 But that’s ok. I love its gorgeous flowers and the heavenly smell when I crush the leaves. Hi Jerry, Before you planted the cardamom seeds, did you rub them with sandpaper to kind of open up the hard seed coat? Thanks. There is no need, they are not hard seed, which is why I didn’t mention it. Jerry, thank you for an informative article. I have just moved into a house and the previous owners loved cardarmom – the false type. Beautiful flowers, and I have a sore wrist from cutting up the stems and leaves for composting/mulch. I will have a never ending supply for compost/mulch, however, I have now been left with piles of roots (and by that I mean 30cm high x 60cm wide in one section), with more suckers appearing in this warm sub-tropical weather. They have been planted in the most inappropriate places, and I would like to get rid of some of the roots for planting out for raised veggie beds. Question: is there a way to get rid of the roots – digging has bent my garden fork, and I am at my wits end…. please help!!! Are you able to give an update on how your seedlings are going 4 years on? I’m very keen as I have just planted some seed out myself. Also, do you have any idea how many plants might produce a good harvest for an ordinary family? I understand they take at least 3 years before they produce. I kept one only. It stands 1.5m high and flowers in summer. Thanks Jerry. So are you getting many pods from your one plant?